Right-wing operatives with links to big retailers going after worker centers like the Restaurant Opportunities Center. The conference attendees were then asked to consider the pushback. “How aggressive can we be?” one slide read. “How do we challenge the social justice narrative?” queried another. Kefauver is a former executive for public affairs at Walmart and a former political action committee staffer for Darden Restaurants, the parent company of chain eateries like Olive Garden and Red Lobster. As a full-time consultant at firms that serve the restaurant and retail industry, he is part of a phalanx of lobbyists and political operatives with a small but focused goal: to destroy what has become known as the “worker center” movement. Kefauver’s alarm at the rise of worker centers, which he has repeated in talks with the US Chamber of Commerce and other business trade groups, isn’t simply bluster. Just as conservatives aimed their fire—to devastating effect—at organized labor and low-wage advocacy groups like ACORN in the past decade, right-wing lobbyists and the businesses that pay them are going after worker centers today because they recognize their potency. With unions in decline—a fact celebrated in one recent ad targeting worker centers—the “alt-labor” movement has helped jump-start a nationwide effort to reshape working conditions for millions of Americans in low-wage jobs. The question is: Can worker centers escape the fate of other, similarly situated groups targeted by corporate smear campaigns? Though many worker centers began as localized efforts to combat poverty, the movement has rapidly spread and matured. These groups still help low-wage workers find legal representation and understand their rights at work. But many now coordinate their organizing with other community groups or labor unions across multiple regions. As Kefauver’s presentation suggested, worker centers are indeed organizing along corporate supply chains to achieve their demands. And in many cases, it’s working. 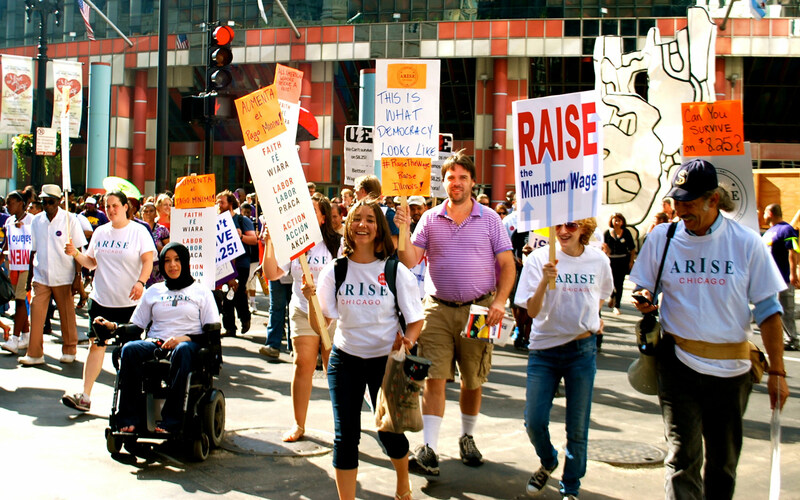 Arise Chicago, a faith-based nonprofit that founded a worker center in 2002, has helped win new safety agreements for hotel workers; negotiate a new city ordinance to crack down on wage theft; and mobilize Walmart employees for an unprecedented set of strikes aimed at hiking pay and benefits. In Florida, the pioneering farmworker group the Coalition of Immokalee Workers (CIW) has successfully pressed for a wide-ranging labor agreement with major food companies to curb abusive working conditions. The Restaurant Opportunities Center, which began as a New York–based group that organized a small number of waiters and waitresses, is now a federation that spans the largest restaurant markets in the country and has come to represent an alternative for consumers seeking information about the industry. With this success has come a new, all-out assault by business. Many observers point to a full-page ad in The Wall Street Journal last July sponsored by Rick Berman, a longtime lobbyist for the restaurant and agricultural industry, as the first major shot across the bow. As The New York Times reported, Berman has since launched his own website filled with negative information about worker centers and has appeared regularly in the media to criticize the movement, particularly the Restaurant Opportunities Center. Some of the attacks, though, are less transparent. This past November, about a month after Kefauver’s presentation in Chicago, a group called Worker Center Watch launched a series of YouTube videos aimed at discrediting the Black Friday protests staged by worker centers against big-box retailers. One video depicted the activists as “professional protesters” who “haven’t bothered to get jobs themselves.” Another video from the group alleges that the Restaurant Opportunities Center (ROC), OUR Walmart and other worker centers are nothing more than union front groups designed to “make more money for greedy union bosses.” The video closes with an appeal not to be “fooled” by worker centers. A week later, Worker Center Watch posted the transcript of an audio recording from a private worker-center meeting in New York that had been obtained by Breitbart News, the right-wing website founded by the late Andrew Breitbart. The headline blared about the offensive “Santa’s slaves” comments made by the organizers, though the actual recording was rather innocuous. When contacted by The Nation, Worker Center Watch refused to reveal its backers. However, records obtained for this article show that Kefauver’s public relations firm, Parquet Public Affairs, registered the website for Worker Center Watch. After I inquired about the registration, the website hosting the record was concealed with a proxy. Kefauver would not respond to multiple requests for comment on what he does or who is paying him. But he was listed as a “consultant” to the National Restaurant Association—the largest lobbying group for the restaurant industry and the driving force against raising the minimum wage—on a schedule posted by restaurant industry lobbyists for a meeting in San Antonio several months ago. The man refused, and Williams began snapping photographs of the flag in front of the worker activists. After the organizers confronted the man with the Soviet flag, he began walking across the street and left the demonstration with Williams. It was apparent to those present that Worker Center Watch wanted to depict the CIW as a fringe organization, even if that meant using an outsider to smear its image. Williams, a former hand on Mitt Romney’s presidential campaign, would not comment on the flag-waving incident. For worker centers like the CIW, dealing with the cloak-and-dagger tactics of the industry is now part of their job as organizers. When the organization began scaling up its agreement with tomato growers and fast-food chains, news reports revealed that a Burger King vice president had posed as his daughter on the Internet to post angry messages about the CIW, calling them “blood suckers” and “the lowest form of life.” The CIW also found out that a private detective firm had been retained to place one of its investigators, posing as a student, into the ranks of student activist groups supporting the coalition. Other worker centers have been subjected to similar stunts. In 2012, Mercury Public Affairs, a lobbying firm retained by Walmart, was caught sending one of its employees, posing as a local reporter, into an event for Warehouse Workers United, a worker center based in Southern California. The assault on alt-labor is multifaceted. Last July, a letter sponsored by Representatives John Kline of Minnesota and Phil Roe of Tennessee called on the federal government to investigate “the line between so-called ‘worker centers’ and labor organizations.” Following this letter, a range of business-friendly groups, including the US Chamber of Commerce and the Capital Research Center, a GOP think tank, issued similar reports tying worker centers to labor unions. “Some alt-labor tactics are as simple as creating union front groups to pressure companies into taking away the secret ballot from workers, making unionization easier via a card-check election,” claims F. Vincent Vernuccio in the Capital Research Center paper. Littler Mendelson, a firm long associated with unionbusting, has tangled with ROC in court over its picketing of New York restaurants. In September, to the delight of fast-food lobbyists, the House Education and Workforce Committee, headed by Congressman Kline, invited Littler Mendelson to make a presentation at a hearing about the role of worker centers. “On behalf of the National Restaurant Association, we thank you,” read a letter from lobbyists with the association to Kline after the hearing. Notably, the hearing was called just as several lobbying groups, including the International Franchise Association, the Retail Industry Leaders Association and Cracker Barrel, disclosed that they had instructed their Capitol Hill representatives to start monitoring issues relating to worker centers. The attacks occur with some frequency, as new groups crop up to undermine worker centers. Picking fights with restaurant workers has been good business for out-of-work GOP operatives. There is the Workforce Fairness Institute, a reconstituted anti-union front now managed by WWP Strategies, a firm made up of Republican campaign staffers that include Katie Packard Gage, Mitt Romney’s deputy campaign manager in 2012. The Workforce Fairness Institute maintains ties to the Association of Builders and Contractors, an anti-union lobby made up largely of engineering and construction firms, and serves as a clearinghouse for opposition research on worker centers. In 2012, an organization called Restaurant Opportunities Center Exposed appeared. The group exists primarily to smear ROC and its leaders, demand investigations of the center, and provide rebuttals to their statements in the press. Mike Paranzino, a former corporate lobbyist, is the spokesman for ROC Exposed—and, like his cohorts, he refuses to say how his organization is funded. In interviews, he concedes that he has restaurant industry support but won’t reveal any names. Instead, Paranzino pivots to his target. “Unions are transforming themselves in the same way that ACORN didn’t just go away,” he said in an interview with a conservative radio host months ago. Although it is now a distant memory, ACORN was once viewed by progressives as the key to empowering vulnerable communities in low-income areas. The organization provided help with housing, job placement, debt counseling and—in a move that attracted vehement Republican opposition—voter registration. But before filmmaker James O’Keefe used undercover videos—some of them deceptively edited—to destroy the group, ACORN faced an ever-increasing barrage of political attacks from the same cast of characters now leading the charge against the worker-center movement. In 2008, the year before O’Keefe’s videos, the Capital Research Center called on lawmakers to prosecute ACORN for racketeering, voter fraud, money laundering and other alleged sins. None of these allegations stuck, though congressional Republicans embraced the proposed lines of attack, priming the public for a negative perception of ACORN, which became a household name when Sarah Palin used the waning days of the 2008 election to turn the group into a campaign issue. Berman, the lobbyist who fired the first volley in the national campaign against worker centers last summer, found business in savaging the community organizers associated with ACORN. In 2008, he created the website Rotten ACORN, which he promoted with a full-page advertisement in The New York Times, to cast the group as an extremist organization prone to skirting the law. Berman’s current anti-worker-center campaign follows a similar playbook: full-page ads in major newspapers, a dubbed video depicting worker-center leaders as Nazis, and continual assertions that the centers are merely labor unions in disguise, using a 501(c)(3) designation to bypass labor regulations. Saru Jayaraman, the co-founder of ROC, finds herself frequently in the crosshairs of the anti-worker-center campaign. For her, that’s not necessarily a bad thing if it helps build momentum for her cause. “When I’m asked about the attacks [in the media], the conversation always turns to a discussion of the minimum wage, which leads to talk about substantive policy and how that impacts consumers,” she says. Other experts note that worker centers don’t rely on state and federal contracts as ACORN did—so even if Republicans are able to gain steam with their investigations, little would come of it. And, says Fine, worker centers might prove to be more nimble than unions or ACORN given their diverse funding base, which includes foundations, labor unions and, in some cases, worker contributions. A waitress in Washington, DC, who would identify herself only as “Catherine” says that groups like ROC have been a lifesaver. Explaining that she’s supposed to be earning more than her $2.77 minimum wage through tips, Catherine says that her manager often assigns her menial tasks without the opportunity to make tips. “They have us doing busy work when it’s slow, like cutting lemons or slicing potatoes,” she says. On slow shifts, Catherine takes home only $40 a day, though she sometimes makes up the difference on busy weekends. “It’s like roulette,” she groans. Through ROC, Catherine says she has interacted with other workers at different restaurants and spoken to wage-theft experts. ROC’s DC chapter has waged battles large and small in the service industry, from pressuring chain eateries to improve their working conditions to helping pass a new city law this year that provides paid sick leave for tipped servers like Catherine. The larger goal, organizers say, is to eliminate the minimum wage disparity for tipped workers entirely, a reform that has already passed in seven states. “I found out about ROC through word of mouth, and it’s really been great,” Catherine says. Asked about some of the attacks on worker centers like ROC—especially the claims that they are simply union front groups designed to profit off her—Catherine just laughs. “I don’t think that’s right,” she says.